In a large frying pan, heat butter and garlic. Slowly sauté the chicken until it is just barely cooked through. (It should be white in color, with almost no browning.) Remove chicken from pan and set aside. Add whipping cream, sambuca, and orange juice to the frying pan and stir well. Add Parmesan, nutmeg, salt and pepper, stirring until smooth. Simmer for 5 minutes. Add the artichokes, cranberries, and chicken; simmer and stir for 10 minutes. That's it for the sauce! Prepare the fettuccine according to package directions. 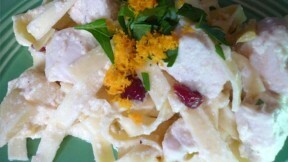 Carefully fold sauce into pasta and garnish with parsley and orange zest. Serve with garlic toast.